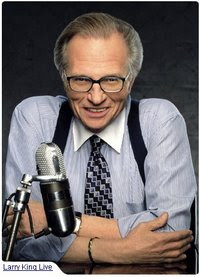 I think Larry King has a crush on Rachael Ray. Doesn't it seem like she's on his show a whole bunch? Well, she'll be back again this week. Rachael is set to appear on Larry King Live on Wednesday, so set up your TiVo. Now, I should warn you that I could be lying to you about this. I found the news on this TV column's blog, but there is no mention on Rachael appearing on the show's website - it only says Michael Moore will be there. It could be, which is common for the host described as "avuncular" and "suspender-wearing", that half the show will involve Moore and the other half will feature RR.